After 6 days in the docks preparing the boat to be hauled out, we finally reached the travel lift at 0830 on Monday, May 22, 2017. The lift operators did a great job as they expertly moved our Island Packet 35 from the water all the way up to the yacht storage yard. The interesting new aspect was how they transferred the 17,500 lbs of boat from the travel lift down onto an 8 wheel diesel hydraulic trailer that they then used to back the boat into a storage location. They use these wireless remote control hydraulic trailers so that they can place the yacht within 12 inches of the next yacht. If the stored yacht is placed with a travel lift. 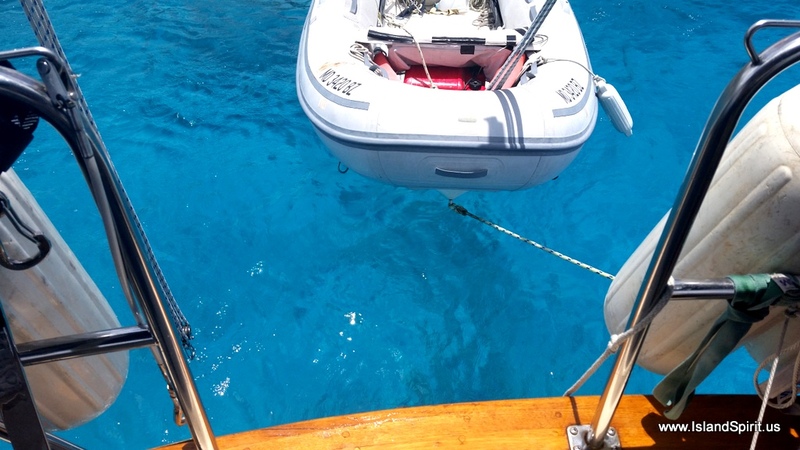 then the spacing between the yachta is much greater due to the width needed for the full travel lift. This entire transfer from one machine to the next took nearly 1.5 hours but it increases the yard storage by at least 25% in my observation. This was a very challenging transfer due to the Island Packet rudder support bar interfering with the machine’s structure. They wanted to remove our rudder support bar and I requested that they figure out another way. They managed to work around this non structural portion of the keel and kept the structure of the trailer from hitting it. Due to this, our boat ended up blocking much higher off the ground. I am guessing our blocking is 24″ underneath our keel. This created a challenge for us covering the boat as what was normally 5 feet off the ground is now 7 feet and up. More on that later. Overall, the haul out process went very well. The boat is now strapped down with 7 hurricane straps attached to concrete footings with steel bars. We are working with Quino Sanchez, the rigging expert, to watch our boat and monitor it through any storms and downpours. The boat will remained closed and locked and his only job is to pump the hand bilge pump in the cockpit. The solar, wind and battery bank are disconnected and there is no need to go inside the boat. Here are photos of the haul out. The travel lift pulls away and can go do another lift. The remote control trailer can now drive the yacht into place. Each wheel is on a hydraulic piston so the yacht can be leveled once it is in position. We placed the bow high to make sure she drains well. Here the trailer is moving out. After haulout and blocking, we immediately started on the sun shade, Coolaroo cover. We began this work around 11 am and by 3pm we had the sides up and the front bow covered to the mast. We also had worked out the aft top piece and how it would go under the boom vang but over the whisker pole. By 4pm, the afternoon sun was so intense and hot that we called it a day, and headed off to our condo to shower and cool down. The next day we began at 0630 and we were able to complete the cover install and sewing by 1330. Overall this process of covering the boat with Coolaroo took us 9-10 hours of work, mostly all done by Hayden while Radeen was working below on cleaning, storing and packing gear for the summer storage time. The cost this year for this was $175/roll and we used 2 rolls. We use a 6′ x 100′ roll for the sides. From this, we make two pieces 6′ x 40′. For the top, we use a 12′ x 50′ roll, which we cut into 12′ x 22′ for the mast to bow and 12′ x 28′ for the mast to the stern. We use UV black zip ties to stitch the fabric together and this year we hand stitched it with the Coolaroo rope and needle and that will be a back-up in case the zip ties fail due to the sun. Once this was on the boat, temperature inside dropped from 106 degrees F down to 95 degrees F. Day two, in the same outside sun and temperatures, the boat never got over 89 degrees F, so we are sold on this fabric protecting the boat from the heat and the sun. We are now hoping for no direct hit hurricanes to land on the east side of Puerto Rico. That is our current risk and we are fully insured via Markel with an added named storm coverage for this area. Here are photos of the Coolaroo process. Top aft piece. Mast to stern is 12′ x 28′ and rests on top of whisker pole. I sewed this seam as I moved aft, after using the zip ties. The top pulls tight aft. As I work my way back, I pull the top tight over the sides, too. This is 1,200 sq. feet of fabric and it works great. Coolaroo makes clips that snap onto the fabric for attaching lines. Once finished, I made cuts for the hurricane tie down straps to attach to the cleats. Job complete. LOOK at the waterline, it is OVER my head. That is due to the 24″ high blocking. This is the highest blocking ever! Coolaroo Sun Cover worked again, this is great! I booked a really cool Air BnB studio overlooking the marina. It has a small kitchen, bathroom and a totally tiled separate shower room and also a beautiful pool. We enjoyed making a hot breakfast each morning and in the evening we prepared simple dinners with food we moved off the boat. This has worked out very well. Imagine, a shower with unlimited hot water and a toilet that you simply push a lever and it flushes. WOW, what a treat! Our kitchen and dining table, gas stove and small refrigerator. Can you find the Island Packet? and one with one other rental unit. Our private patio for wine and cheese. There is a lovely breeze here every evening. At night, we are lulled to sleep by the tree frogs peeping. Such a lovely spot! 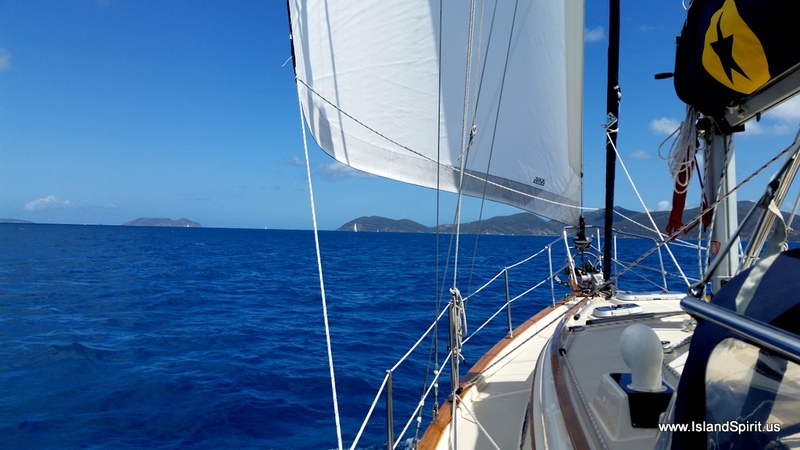 After our three weeks of bliss in the British Virgin Islands, we sailed back to St. John and spent 5 nights circling the many wonderful harbors. 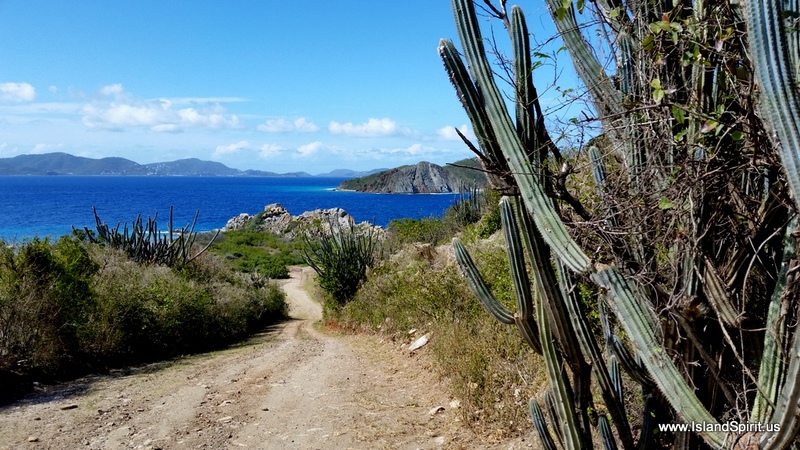 We learned that only 2,700 people live on St. John. We also learned that there is nearly zero anchoring as well. The joy is that the US National Parks services manages 300 mooring balls for cruisers to use for $26/night. We secured our NPS “Golden Pass” so this gave us a 50% discount on the mooring ball fees, what a deal. You have to love supporting the National Parks Services as they do such a great job with a very limited budget. 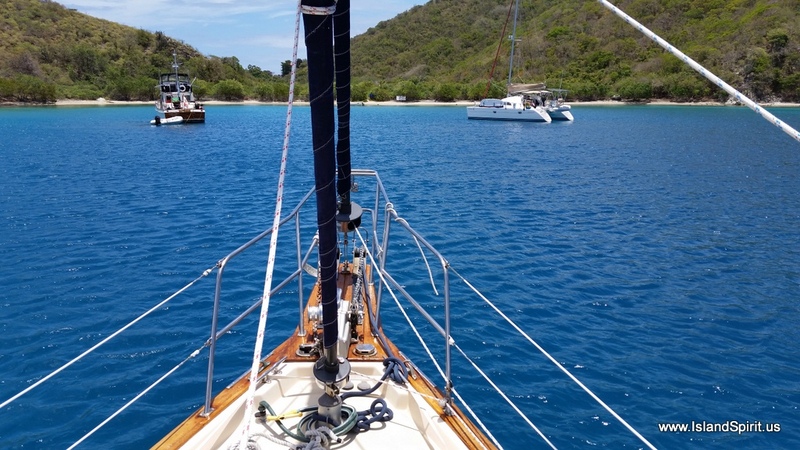 We anchored in new places along the south shore, including Saltpond, Cruz Harbor and Hansen Bay and look forward to exploring more of St. John next season. 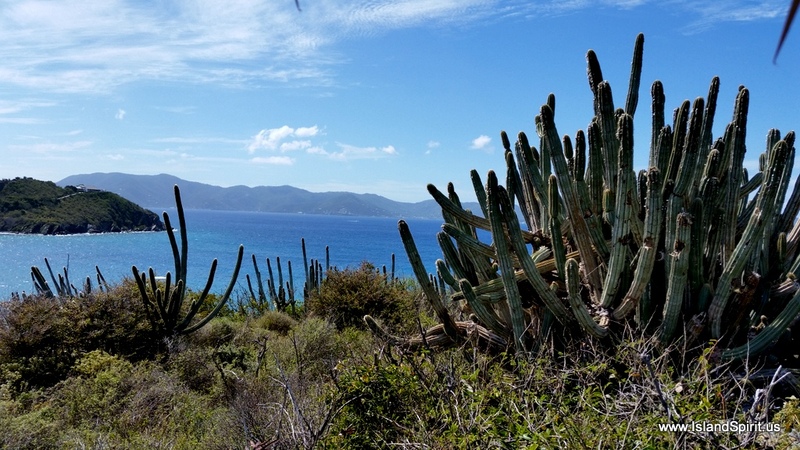 Onward to Charlotte Amalie, St. Thomas. We love to anchor in towns, and here we had this town immediately off our stern. 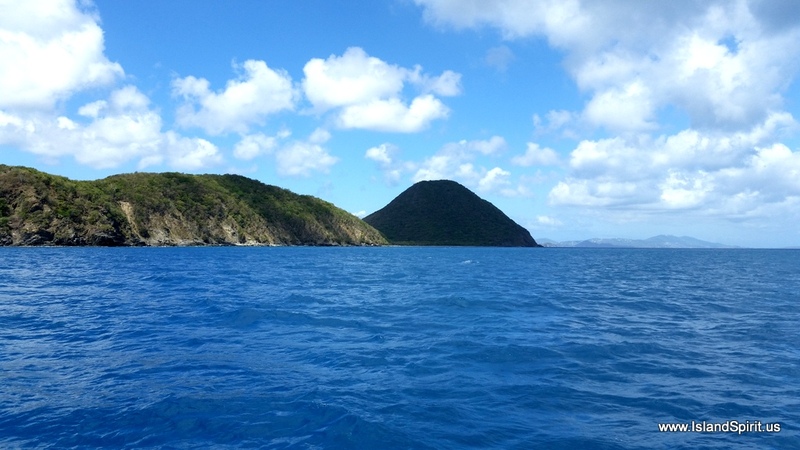 After entering the main harbor, we went directly over to the east corner and dropped the anchor off Yacht Haven Grand. Usually there are one or two cruise ships in port, but lucky for us there were none, so the town was far less crowded. We were enticed by a Facebook ad to head out on a date night to one of the finest restaurants in town called “A Room with a View.” We booked a table for 1830 and enjoyed the best meal of the year! WOW, what a place this was, with excellent service and delicious food. Our table overlooked Island Spirit anchored down in the harbor. 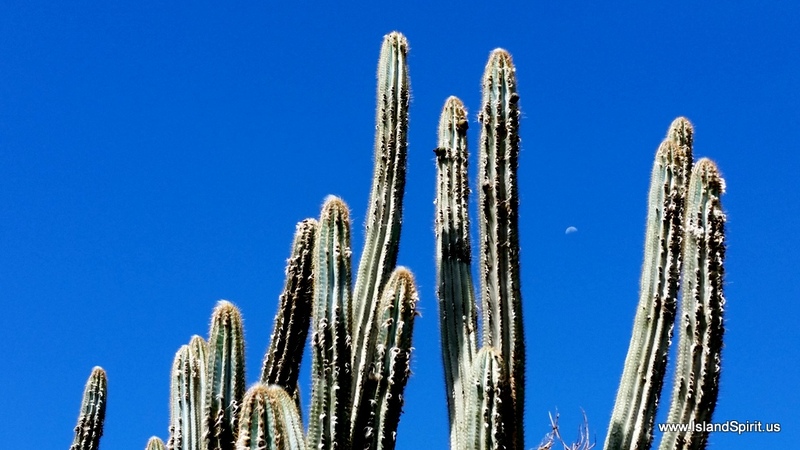 See cool photos below. 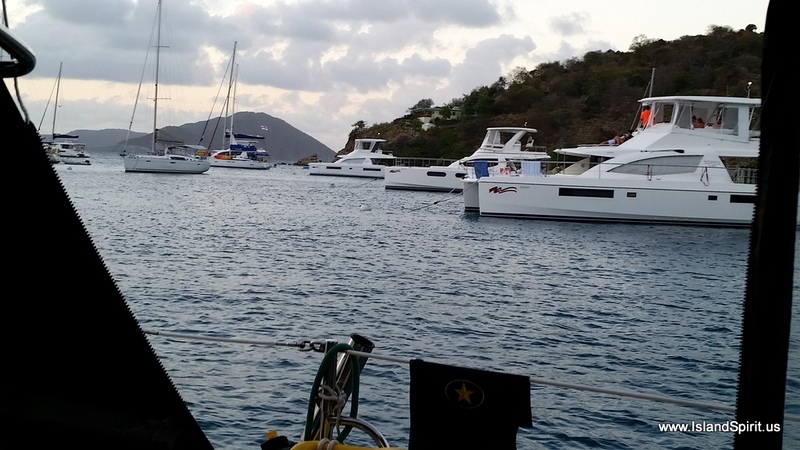 After one day in St Thomas, we topped up the diesel tank at Crown Bay Marina and sailed west. 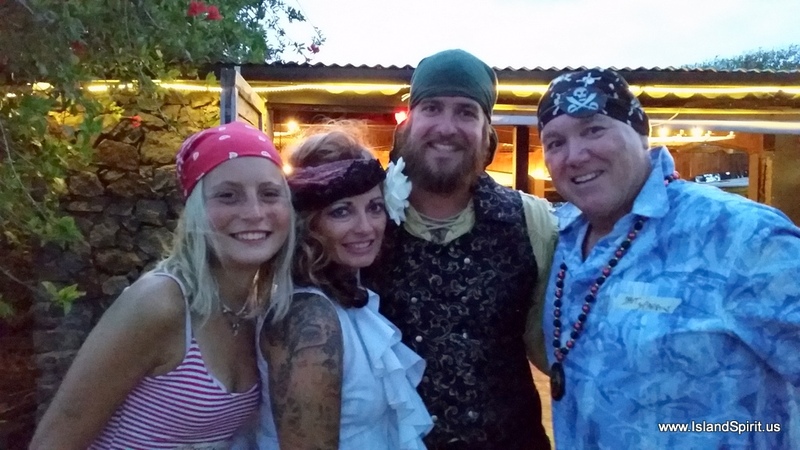 During our two night stop on Culebra, we rejoined sailing buddies Sea Star and Fezwig. We took off the headsails and decomissioned the dinghy. Ashore in Dewey, we had lunch at the famous Zaco’s Tacos. All three boats booked slips at the massive marina Puerto del Ray, Fajardo (with 1,000 slips!) to decommission and haul out May 22 for safe land storage during hurricane season. 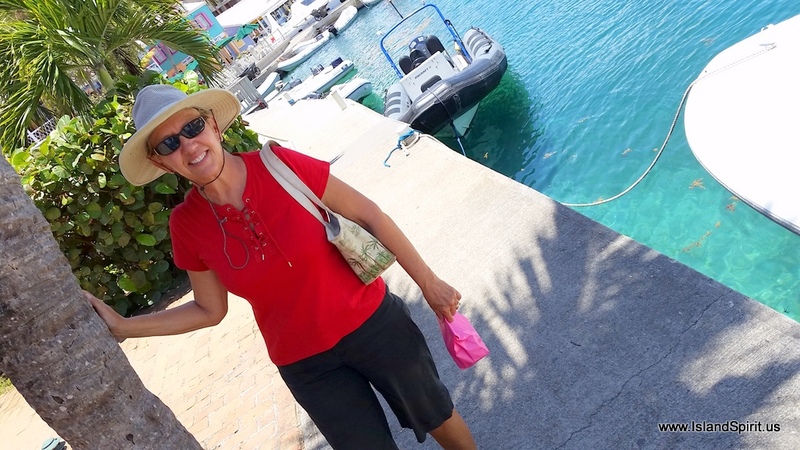 We had planned to haul out in Grenada, but we got lazy and fell in love with the BVIs and USVI and felt we should do more of this area next fall before sailing down island. 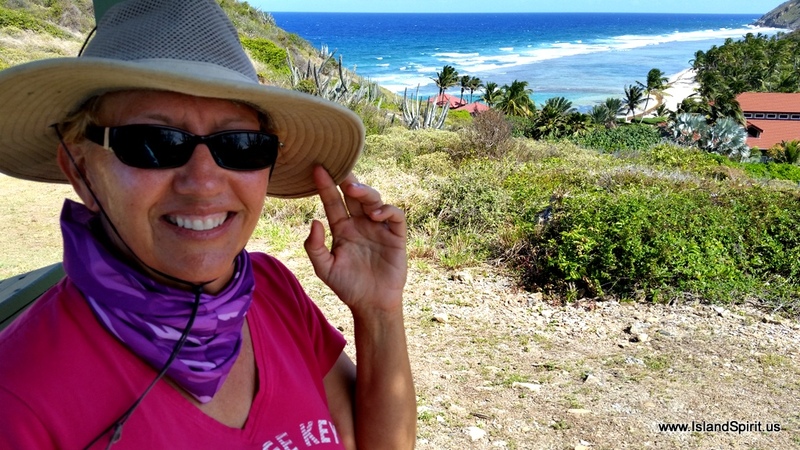 We were close, it is only about 350-400 nautical miles to Grenada, but it was a real joy to slow down and take in these beautiful, familiar islands, beaches and coral reefs. We have all next season to sail down island and that will only be 400 nm! We usually travel 2,000 to 2,500 nautical miles a season so next season will really be easy! 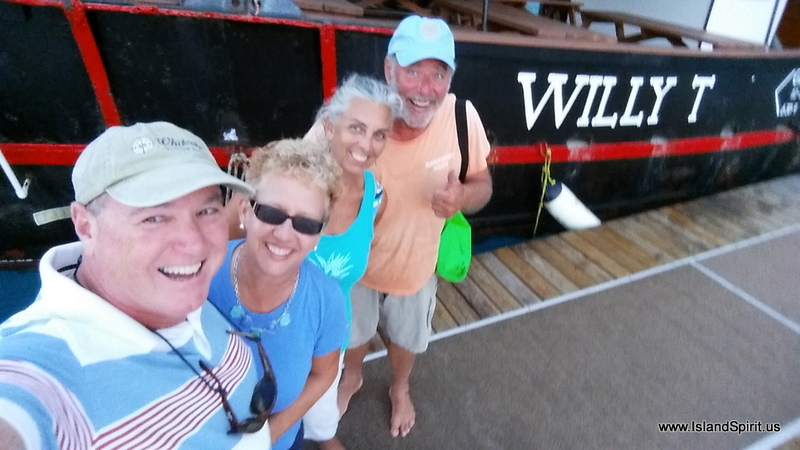 Now that we are docked in Puerto Rico, we have taken off the sails, the canvas, washed the boat and are stuffing everything below decks while we live aboard with this craziness. In a few days, we will haul out. Coolaroo Sun Shade has been shipped in and we are ready to make our second custom cover Monday and Tuesday. 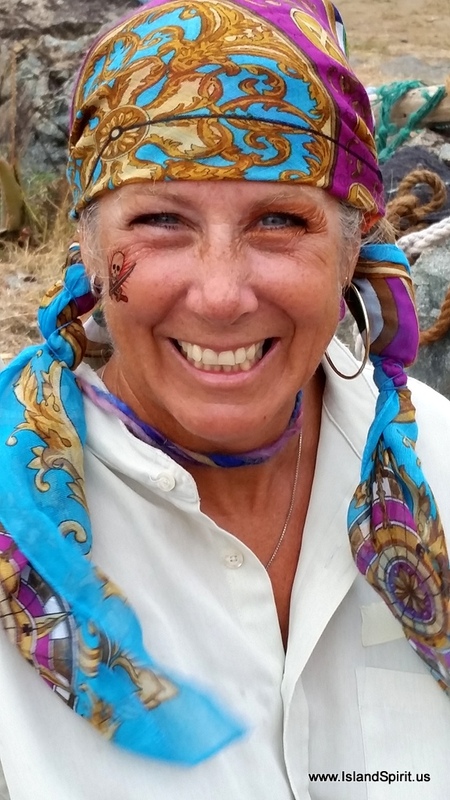 For now, we are preparing for haul out and are already missing the joy and peace of the cruising life. 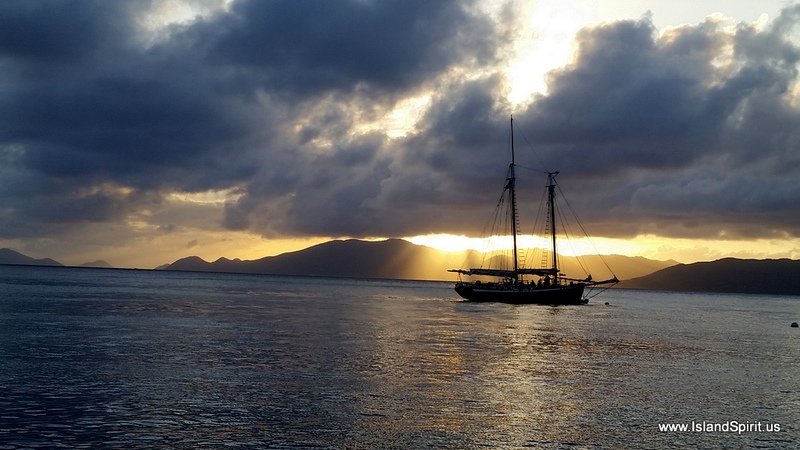 We can not wait to relaunch November 6 and get Island Spirit sailing once again. Here are photos, lots of them, to catch up on. Time to finish the de-rigging and prepare for haul out. Then Monday and Tuesday it will be Coolaroo Shade Cover Round #2. 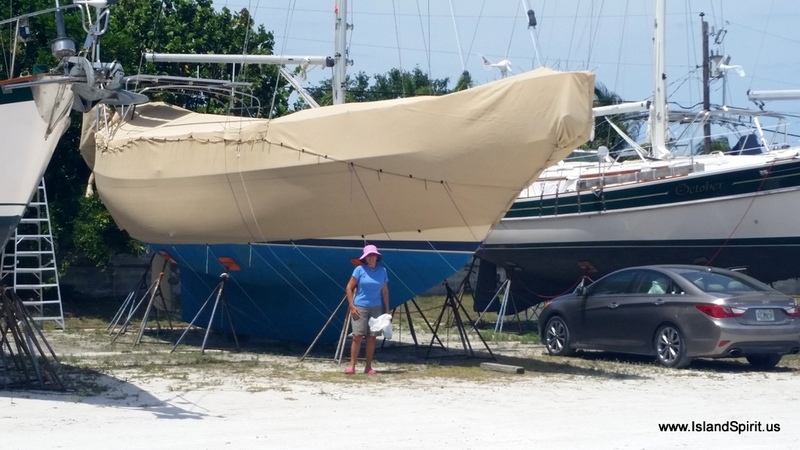 We will cover the entire boat like we did last year with a 90% UV breathable sun cover fabric. This is what it will look like when we have the cover on…. 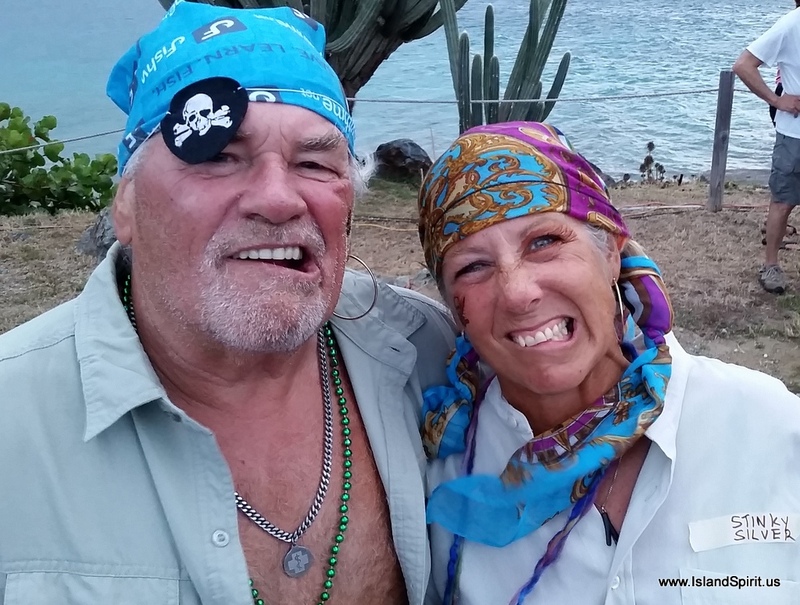 We sailed into the British Virgin Islands on April 12, 2017 from St. Thomas to Great Harbour, Jost Van Dyke, where we picked up a mooring ball at Foxy’s and checked into the country from our own boats for the first time. Even though we have been here 9 times before on charter boats and land based vacations, this time it all was so different and new yet so familiar. 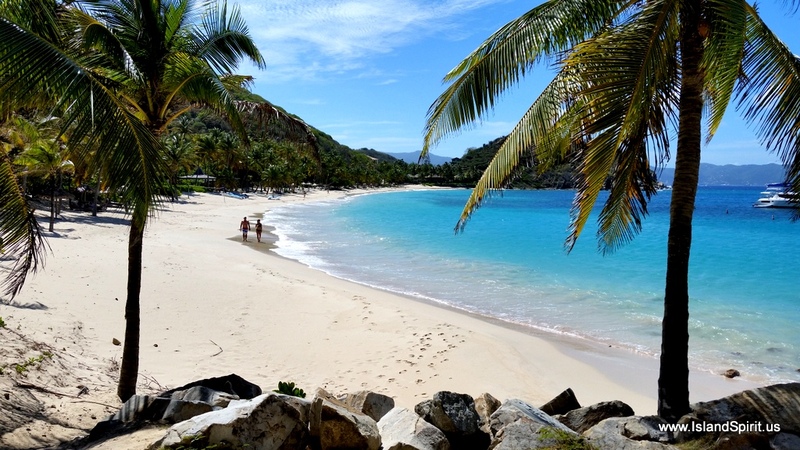 Now it is May 8th and we are cleared out to leave to the USVI, St. John, where we will explore the USVI for a few days before making out way back to Puerto Rico to haul out on May 22. 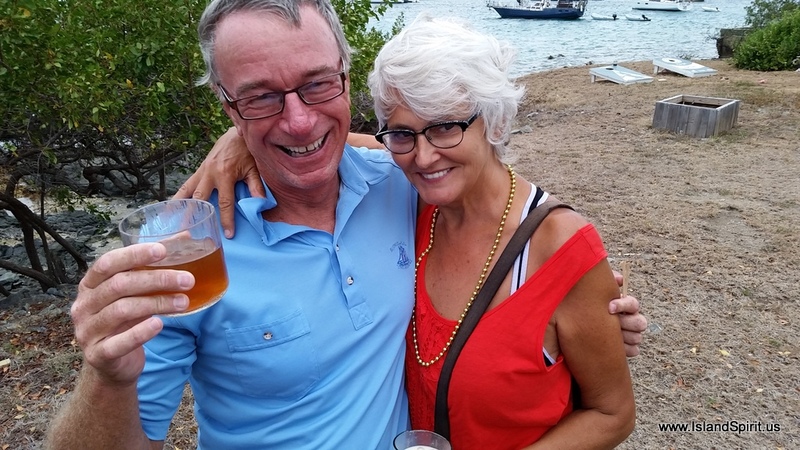 While here in the BVI’s for the past 3 weeks we toured all the popular locations: Sandy Key, Sandy Spit, The Dogs, North Sound, The Bitter End Yacht Club, The Baths, Trellis Bay, The Last Resort, Road Town, Salt Island, Cooper Island, Peter Island, Norma Island, The Indians, White Bay on Jost van Dyke and then to West End/Soper’s Hole to clear out. The changes we have seen is that every single harbor has 30+ mooring balls which are designed to prevent anchoring and to help the charter fleet. There are 10 million catamarans running around as charter boats, some bareboats and some with professional captains. 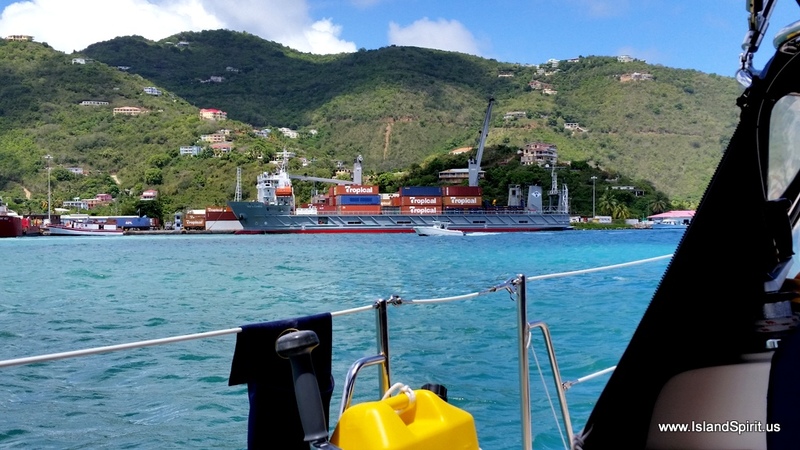 All the harbors turn over every day with the mooring balls being vacated by 9am as the charter boats push onto the next destination in the one week they are here. So getting a ball is easy between 0900 and 1200. After that, it is a free for all battle with boats blasting through the harbors racing to secure the last available mooring ball. When all are taken the only thing left to do is to drop an anchor in 40 to 50 feet of water and let out 200+ feet of anchor chain, if you have it. 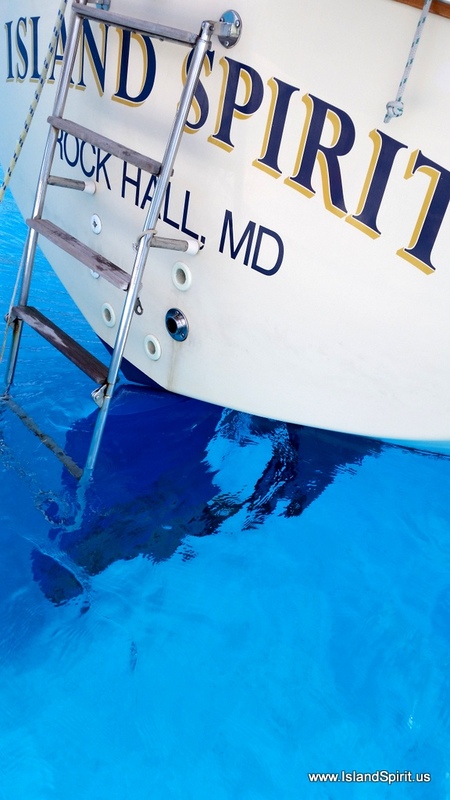 Most charter boats have about 100-150 feet….ooops! 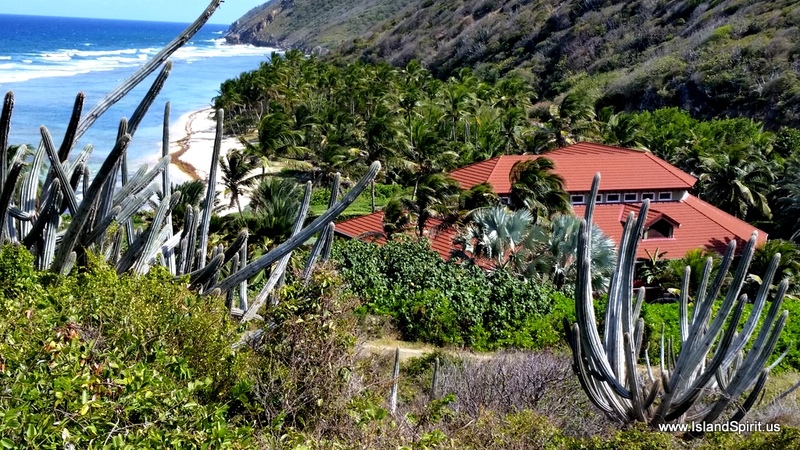 The BVI islands and many destinations are still fantastic to visit, many unchanged but a few, like Cooper Island Beach Club, were really improved and a very nice surprise. 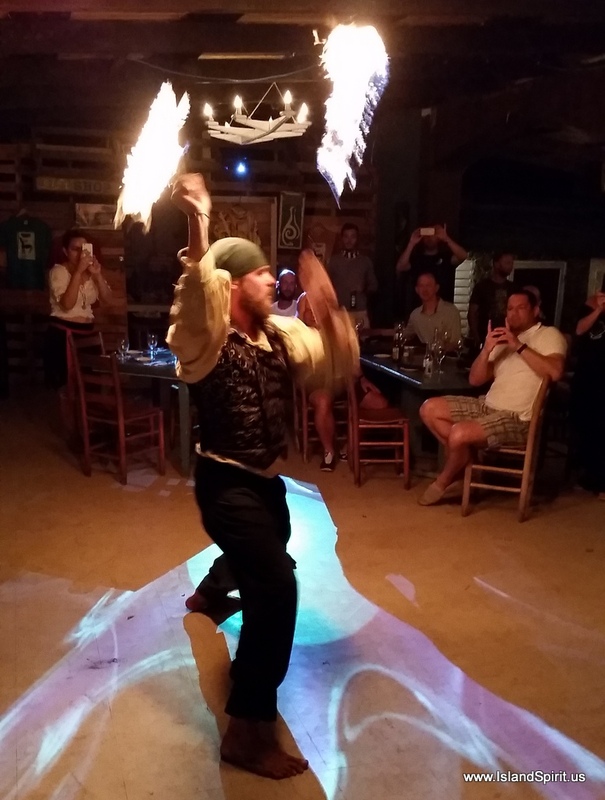 The Bitter End Yacht Club is still one of our favorites and it has not changed, and we like that. 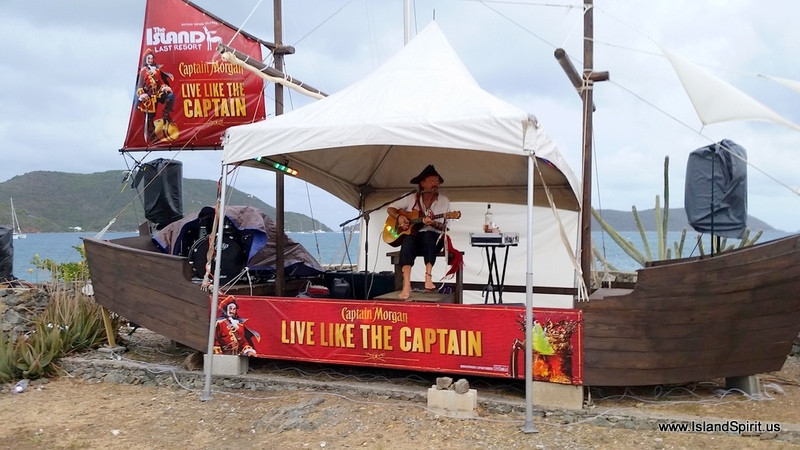 Of course Saba Rock is now 10 times the size of the original rock with a fantastic bar and a fun tarpin feeding show at 1700. 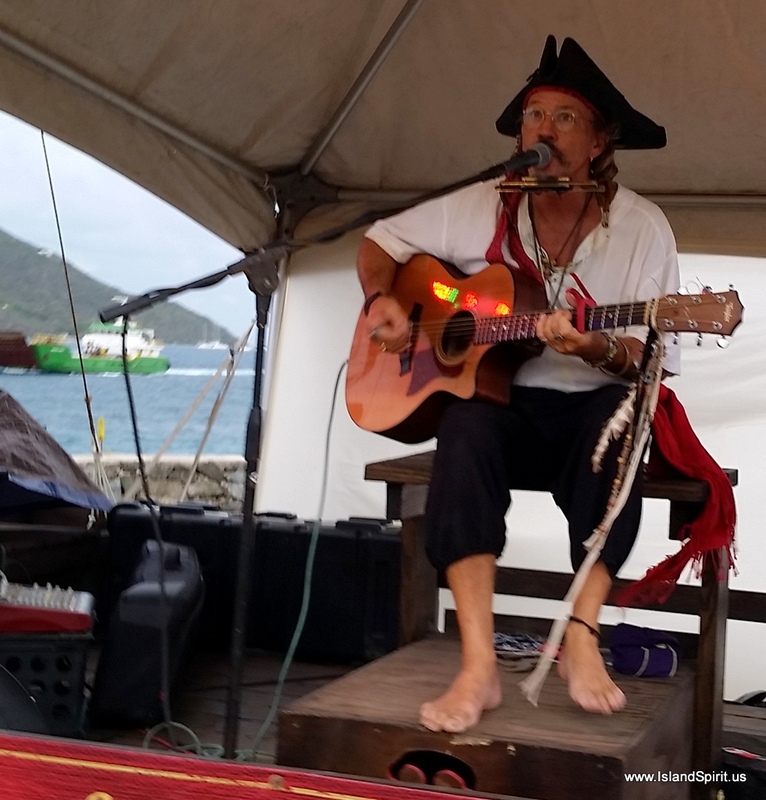 Trellis Bay and the Last Resort along with De Loose Mongoose are very fun places to hang out. 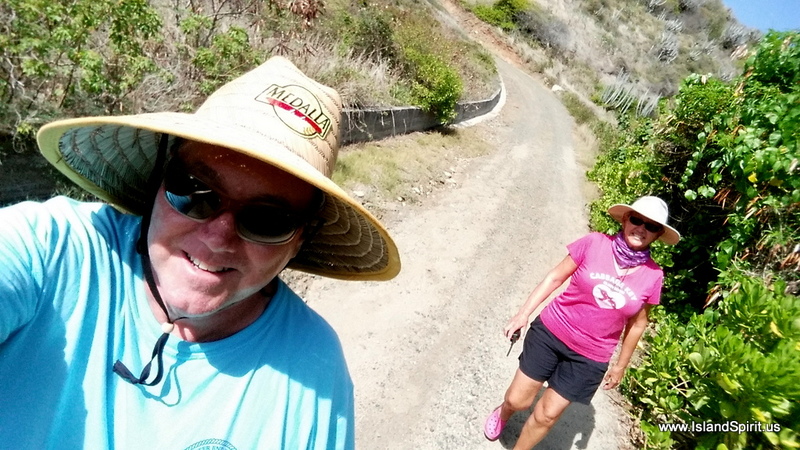 Snorkeling has been wonderful and the beaches and walks have been a dream as well. 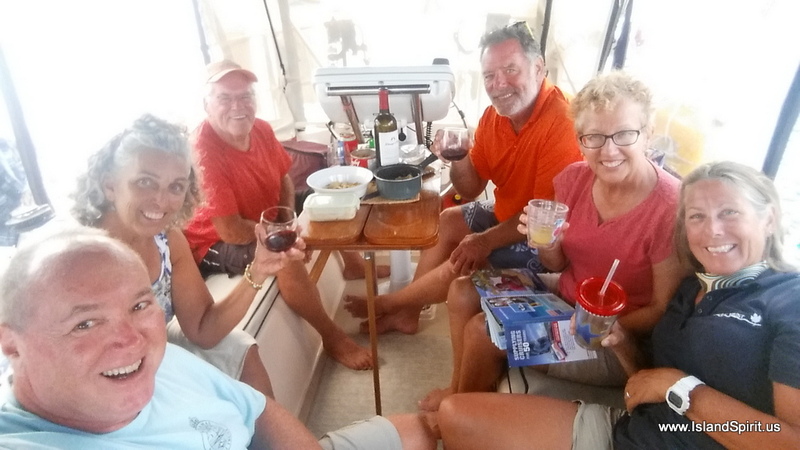 We are really enjoying our boat buddies, Lauren and Bill on 42′ Grand Banks SEA STAR and Meloney and Don on 380 Lagoon FEZYWIG. 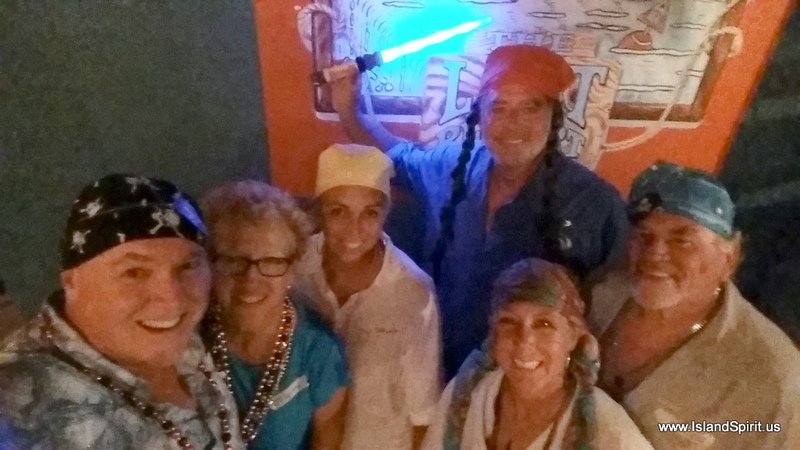 We are an unusual bunch and we think there is a funny story to tell that would start out….A Motor Yacht, a Catamaran and a Monohull pull into a harbor and ... but that is as far as we have gotten. We are all very lucky to have buddies to run around with and to share the discoverr and the adventures together. We will all store our boats in Puerto Rico and actually be on the same flight out of SJU to PHL. 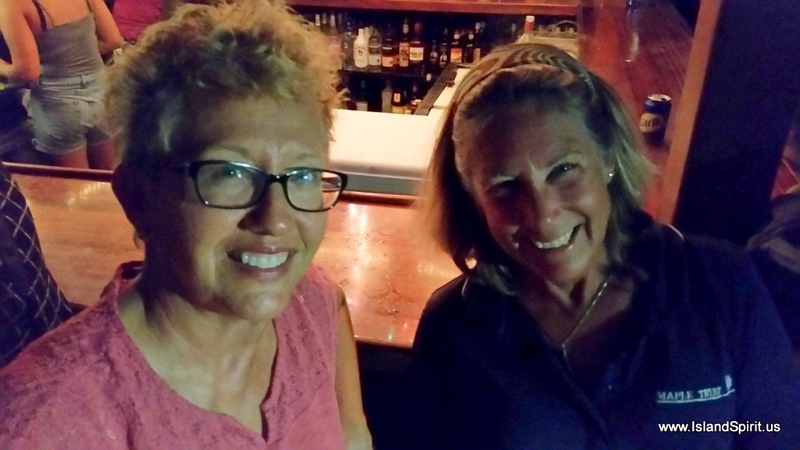 Sea Star is heading to Canada via Buffalo NY and Fezywig is heading to Toronto for the summer. We are heading to PHL. 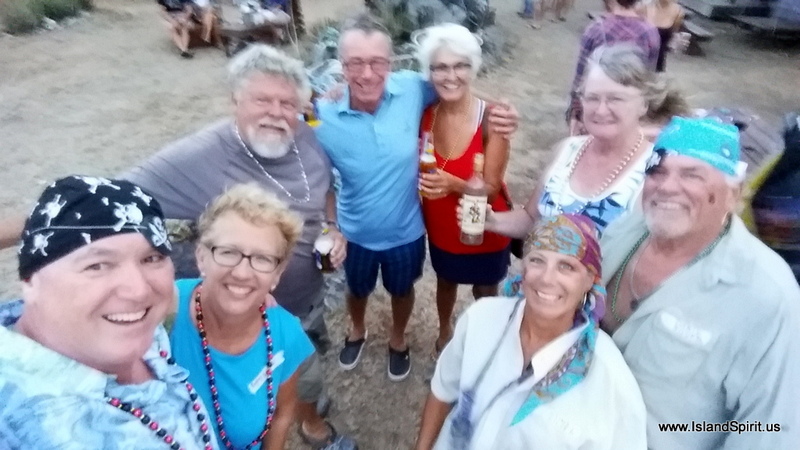 Here is a fun gathering on Island Spirit off Norman’s Island. 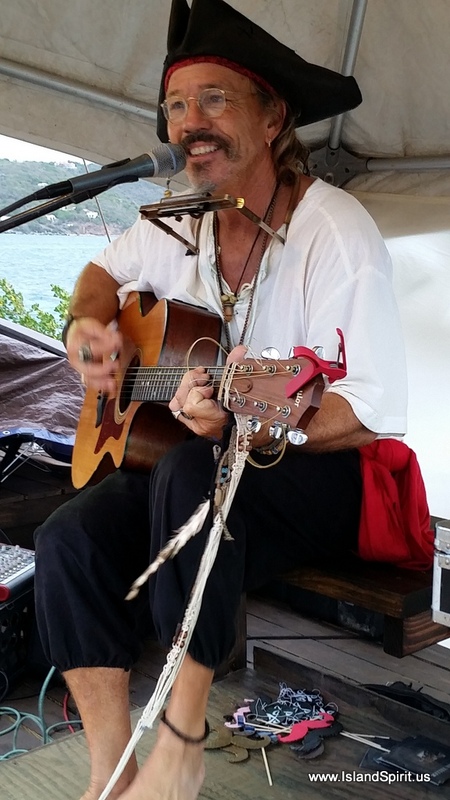 It has been a very very enjoyable British Virgin Islands tour for the first time on OUR OWN boat. 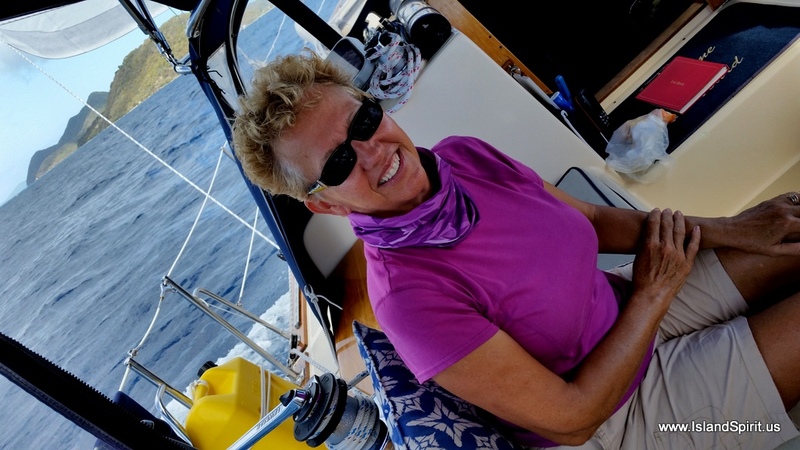 For now, it is onto the USVI and back westward….downwind….yahoooo….to Fajardo, Puerto Rico where we will haul out on May 22 and store our boats until Nov. Here is our InReach tracking map of our travels around the Virgin Islands. 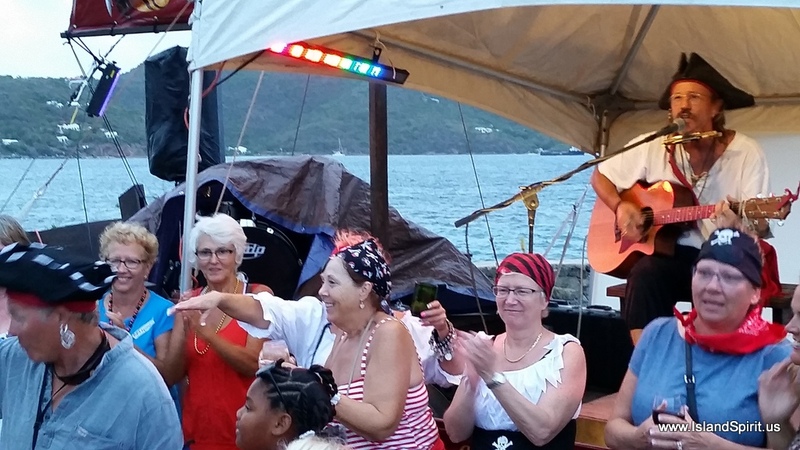 Here are some photos of our BVI wrap-up and the many beautiful sailing scenes and fun times we have enjoyed. 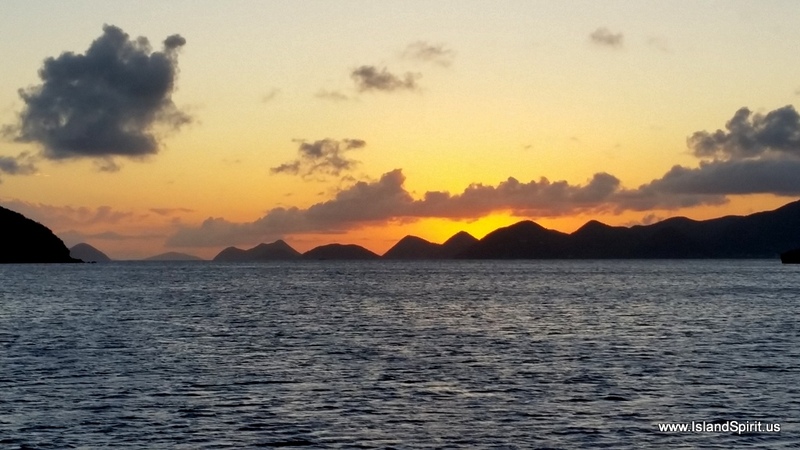 There is no better life than cruising….none! Oh No, trouble will happen at the Willy T! Willy T (again!) and Team Six Knots. We need to come back here in November and December. Radeen and her latte, spoiled girl. 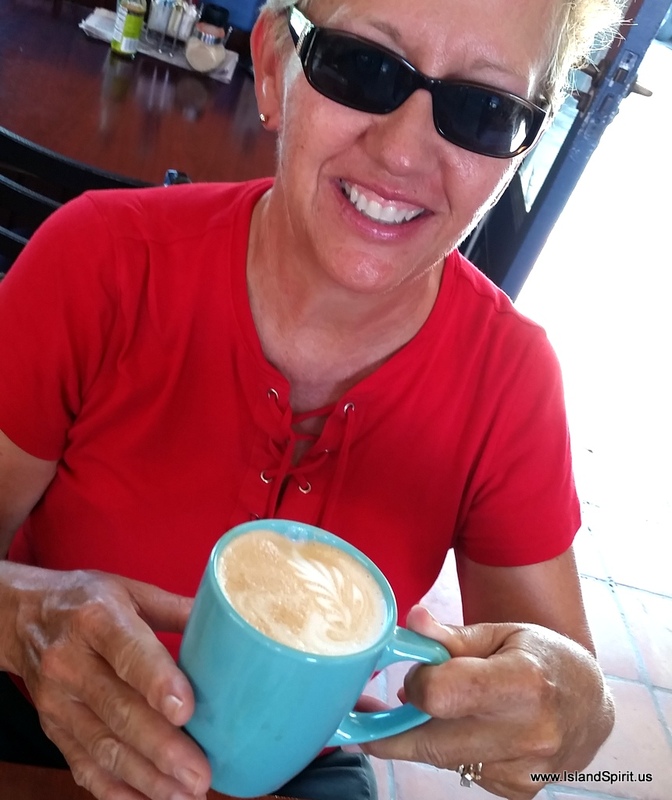 Laundry drop off day, now off for another Latte…. 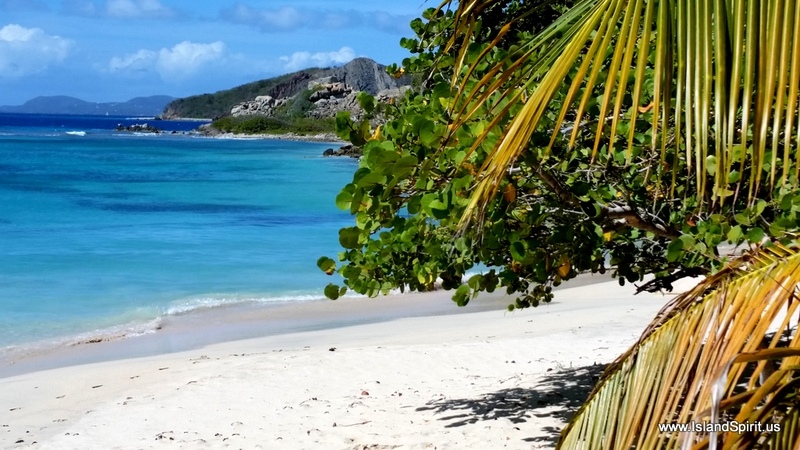 Now time for St. Johns, St. Thomas, Calebra and Culebrita enroute to Puerto Rico. 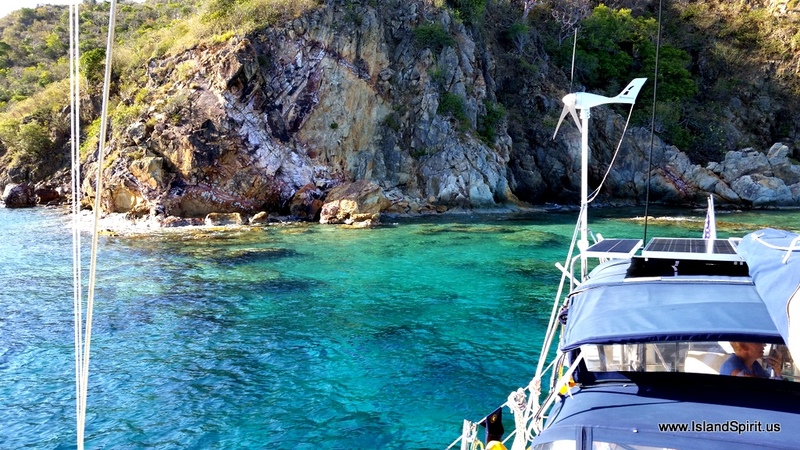 Anchored in Great Harbor at the eastern end of the harbor at Peter Island turned out to be a fantastic location. The anchorage was deep at 40 feet so we laid out 200 feet of chain. What we liked the best was that there was no roll or wrap around swell and for one night our boat did not rock from side to side, but rather sat flat and calm. That may not sound like a big deal but it really is. 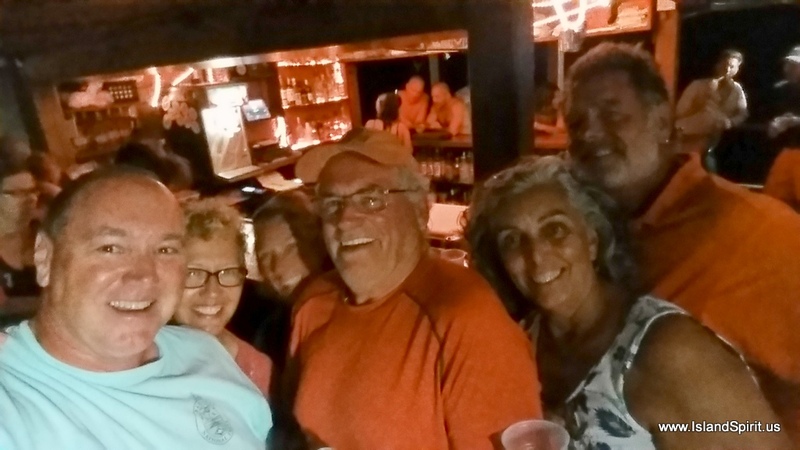 Being below decks all night with the boat rocking from side to side can be uncomfortable plus plates and glasses slide off the table while dining. When we chartered here, we were usually on catamarans, so the rolling is much less noticeable. 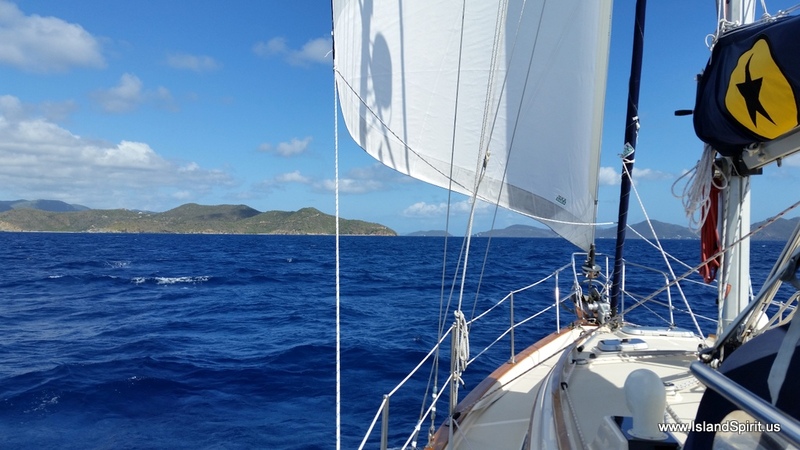 We are finding very few anchorages or mooring balls that provide a calm flat anchorage. This one, Great Harbor, was calm. 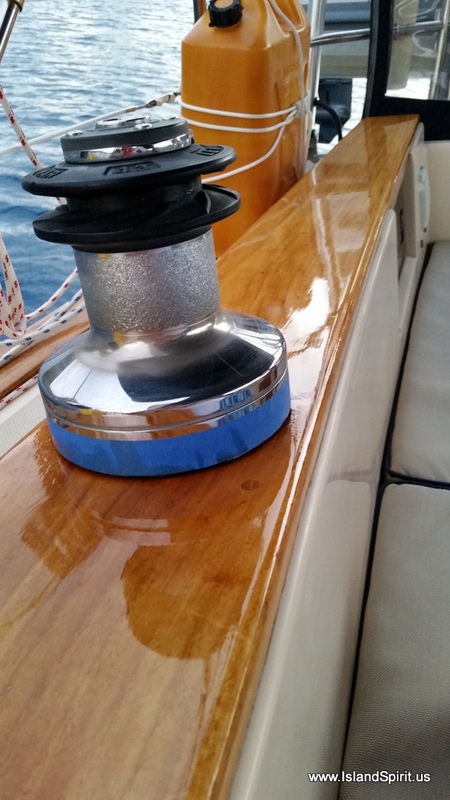 We took advantage of the good conditions to varnish teak and compound and wax the cabin top. 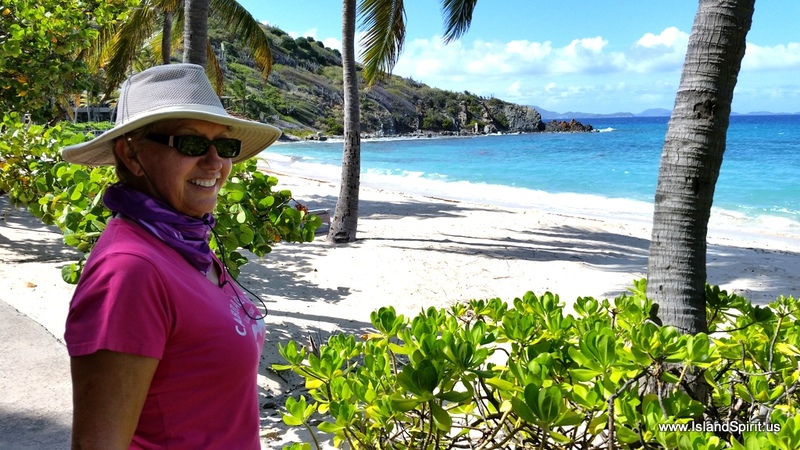 Taking the dinghy to the head of the harbor and landing on a gravel beach, there is a trail that leads over to the Peter Island Yacht Club and then out to Deadman’s Chest Bay. Yachtsmen on anchored boats are actually invited to use one particular beach, a large and lovely beach with shady trees. (See sign below.) This was very surprising. 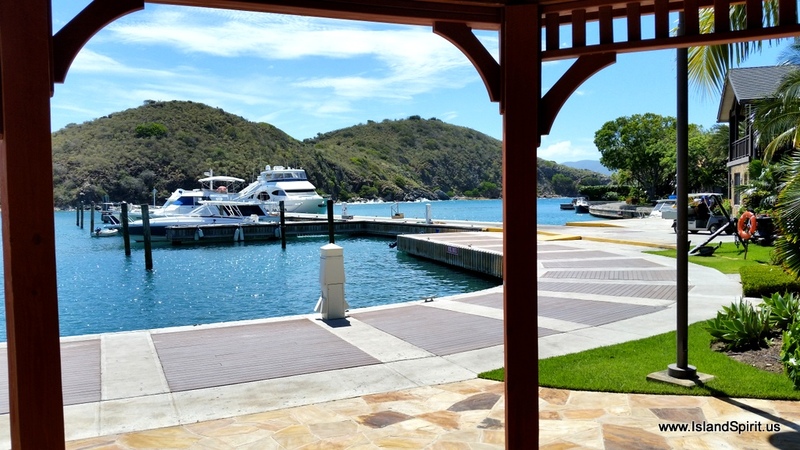 Peter Island Yacht Club is a very upscale resort with a marina and mooring balls for $65 per night. 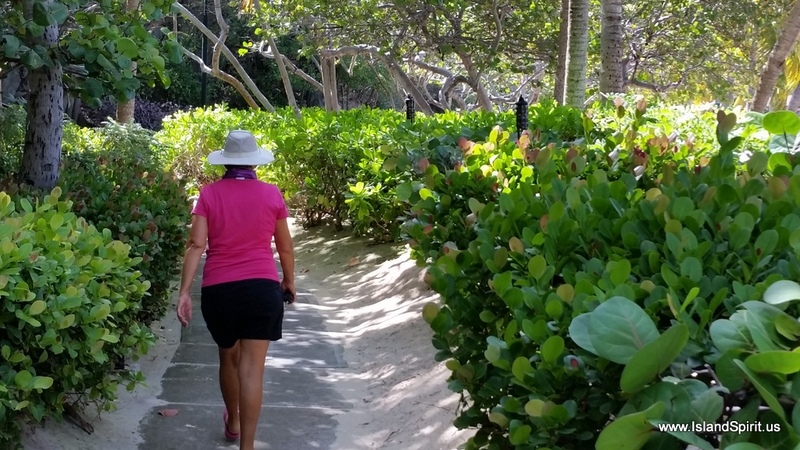 Golf carts take guests around the property and over the mountain 5 miles to a huge beach on White Bay. There a large spa and several different styles of beautiful accommodations. 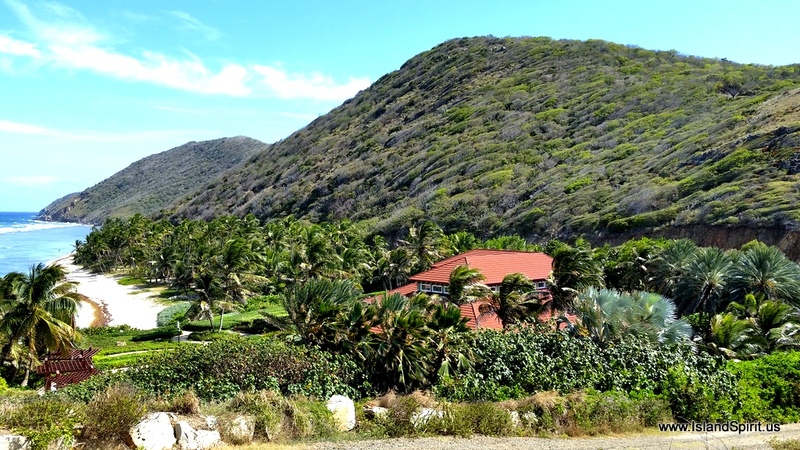 It is unrecognizable from July 1987 when we had an elegant breakfast there while aboard a Whitby 42 charter boat named “Winds of Paradise.” We enjoyed our hike to a look out cabana with a 360 degree view while the crews of Fezywig and Sea Star went snorkeling. 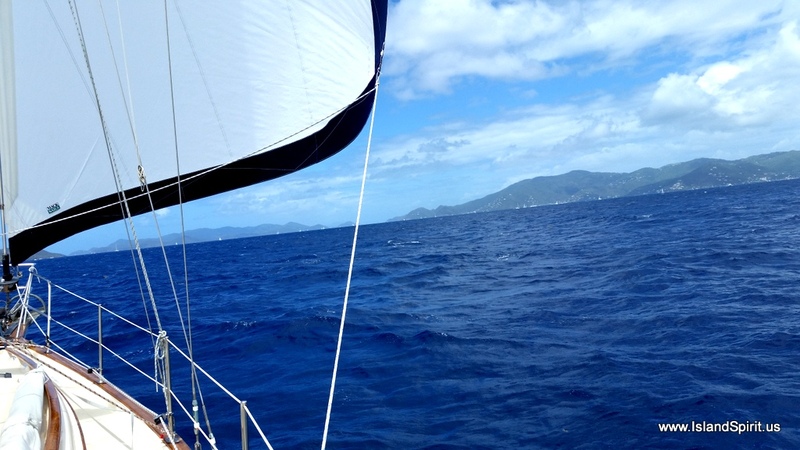 Sailing and motor sailing from Cooper Island to Peter Island is downwind and it is only 5-6 miles, so we were lazy and we simply sailed a jib. I am always amazed at the color of the blue blue blue water. These are all cell phone photos. Look at the beauty…. Look at the water inside the harbor where we dropped anchor in 30-40 feet. 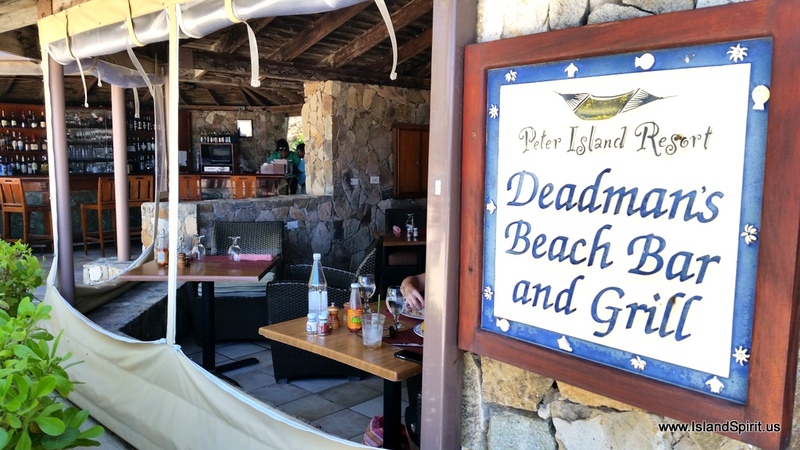 These photos are from our long walk around Peter Island Resort and Deadman’s Bay…. 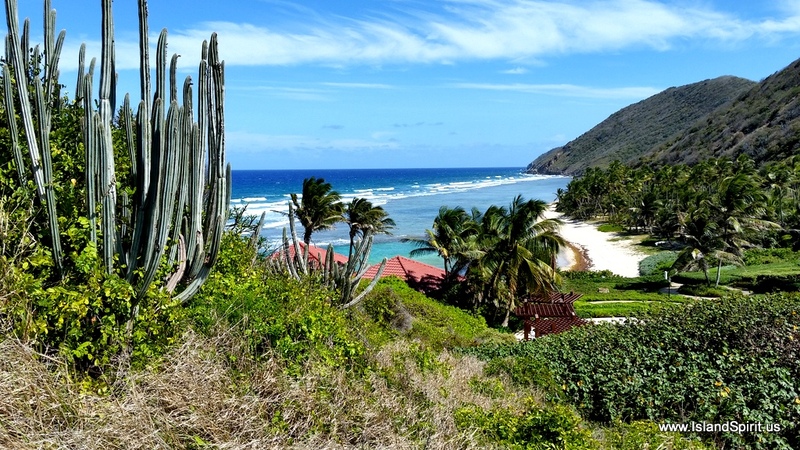 Great Harbor on Peter Island is really A Great Harbor! 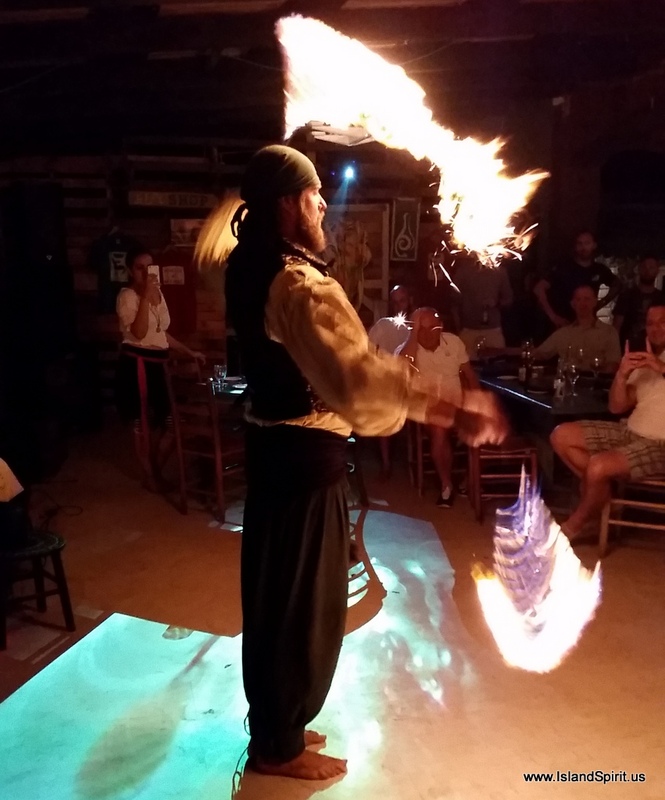 One of our favorites this trip so far…. 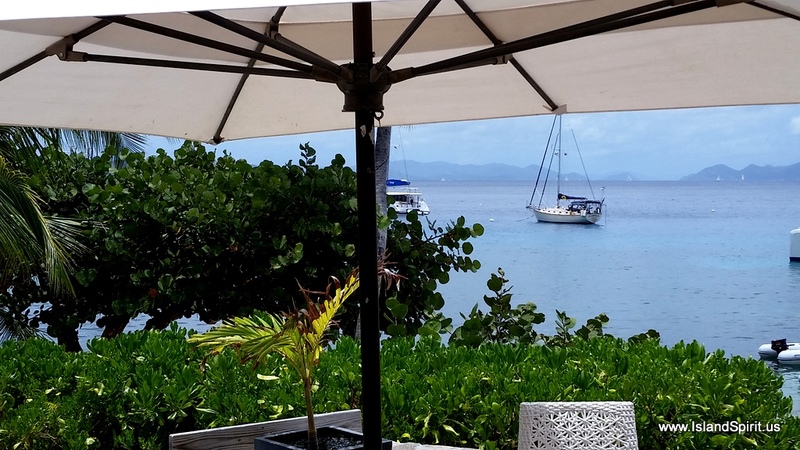 Hands down, Cooper Island Beach Club at Manchioneel Bay has the most blue blue clear waters of any harbor in the British Virgin Islands. You can see the bottom at 30-35 feet deep, you can see green turtles swimming past the boat along with many tropical fish. 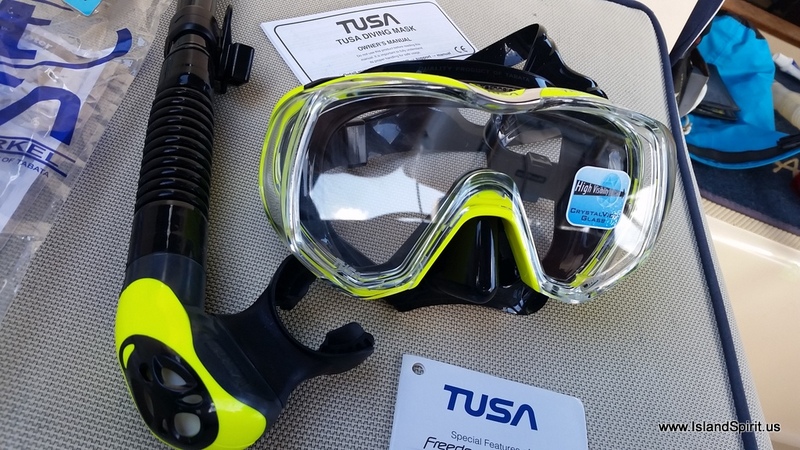 You can snorkel and dive right off your boat along with the dive instructors training new divers right in the harbor. 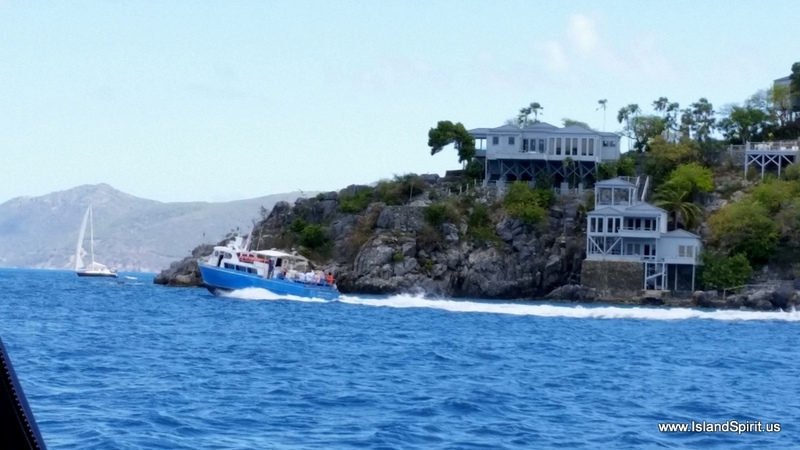 Then to add to these great water activities, there is a beautiful reef on each end of the harbor which is a short dinghy ride away. There are national park moorings for dinghies so we do not damage the reef by dropping an anchor. They even have underwater web cams where you can watch the fish LIVE and maybe you will even see a swimmer or diver. Very cool idea. This live feed is displayed on a 60″ TV mounted over the bar. Way cool. 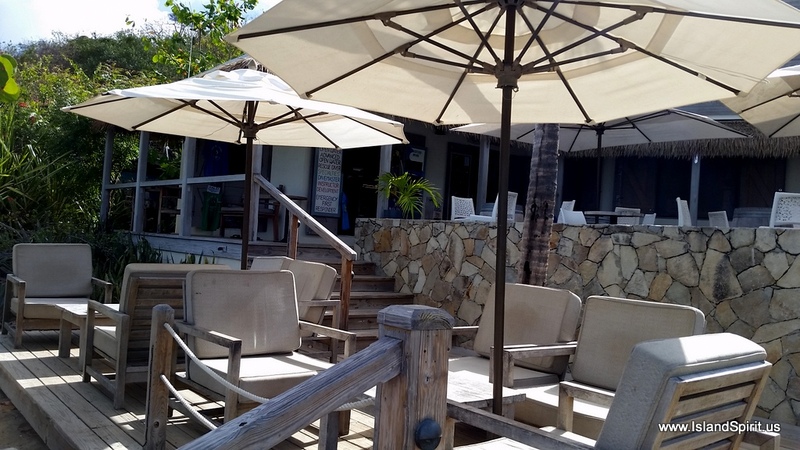 After a fun full day of water sports then it is time to enjoy the outstanding happy hour where their rum punches, painkillers and well drinks are two for seven dollars! WOW, guess what? The bar is full every happy hour, no kidding. 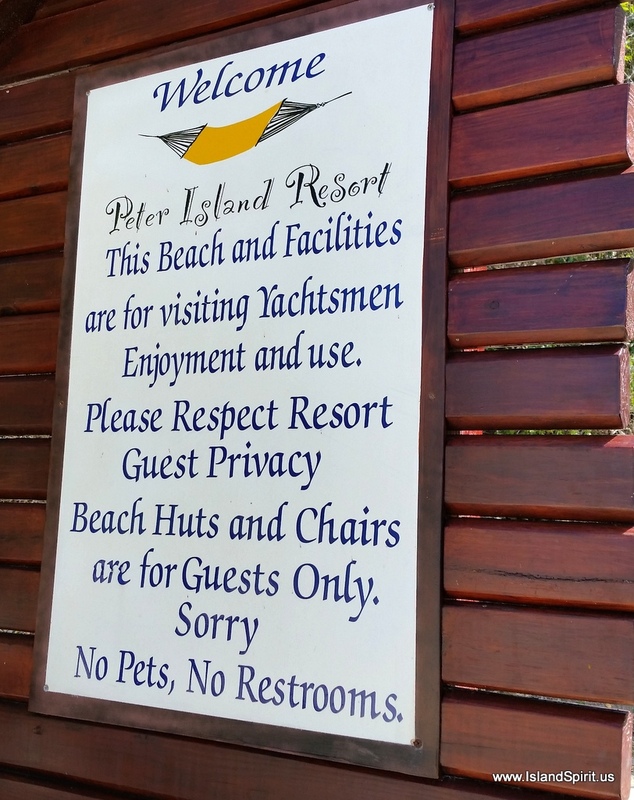 Copper Island Beach Resort has hit a home run. They have games to play, comfortable furniture and umbrellas for your use. They really make you feel welcome. The site is very well designed, upscale, spotless, and provides something for everyone. 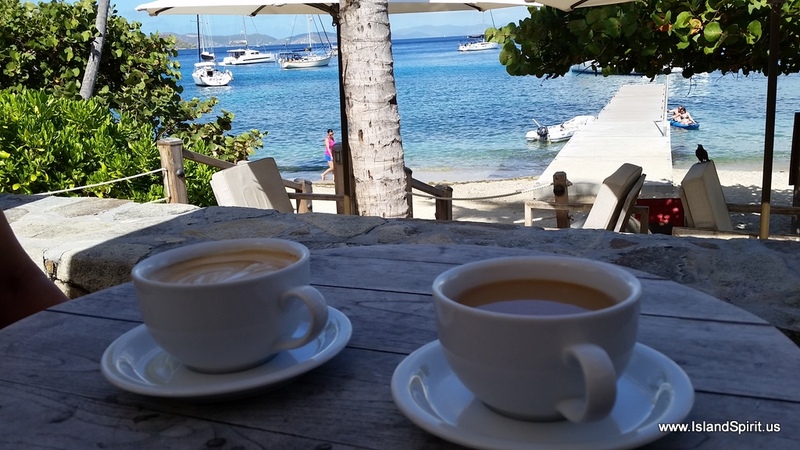 Coffee shop, ice cream and pastry shop, dive shop, rum bar, gift shop, cottages and a 5 star restaurant. We have now been here twice and we are sure to spend more time here next season on our way back through. 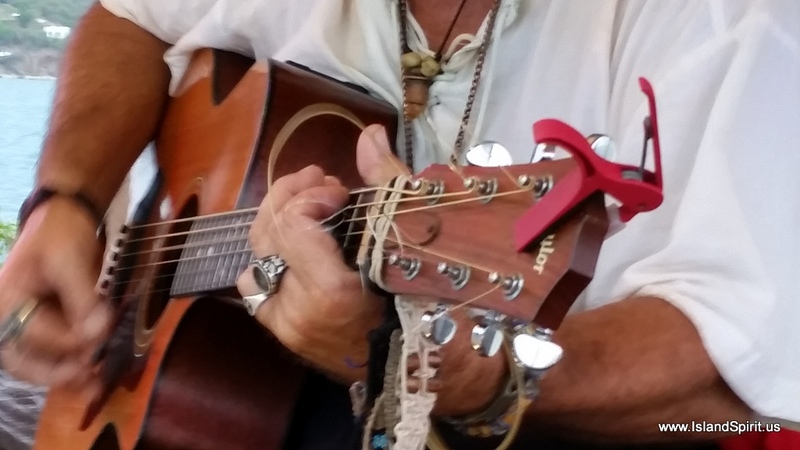 For now, we are simply hitting all the key places as a review for this April/May time frame and then in late May we will store our boat in Puerto Rico and head home. 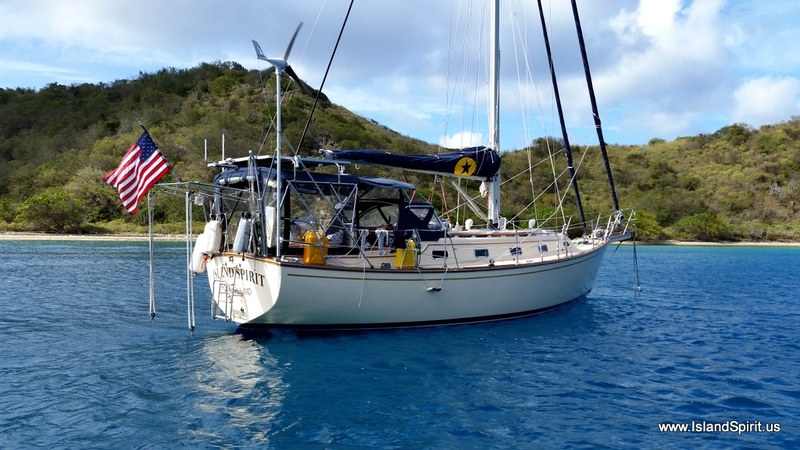 We will be returning to the boat in November and go to the BVIs for Dec. It has really been great spending far more time here. It is dream come true to NOT be on a one week charter boat, but rather to be on our own Island Spirit and on our own time frame. What a different experience this has been. It is really wonderful and these photos will show that as well….enjoy. 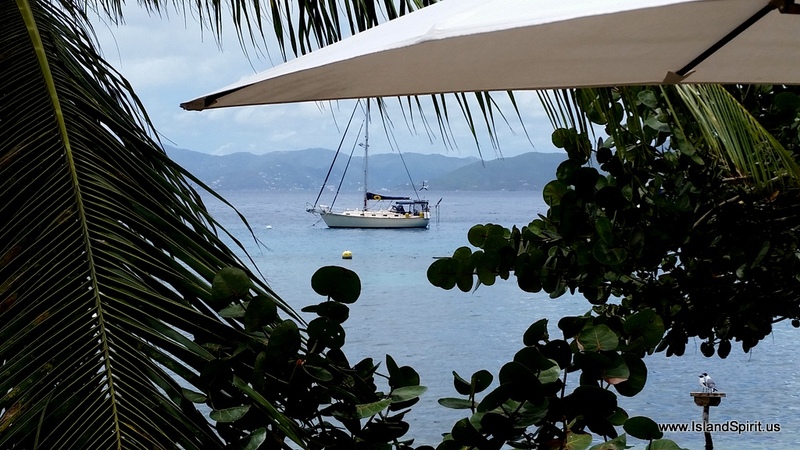 Oh yes, It is the BVIs so it is charter boat madness. They are bigger than ever before! to replace out 1991 vintage models. I love to take photos with the GoPro camera when snorkeling. I especially like to photograph the water surface with bright sunlight coming down onto the reef and to capture the reflections of the reef back up onto the water surface. Here are some shots focused on this idea. Cistern Point snorkeling. We saw squid, file fish and a huge lobster, in addition to the usual fish. 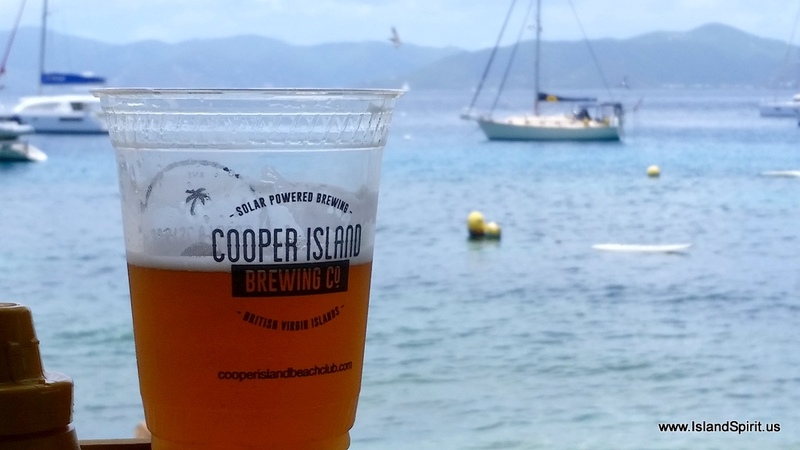 Here is a photo from the Cooper Island Beach Club web site. You can see why this place would have such clear water. Look at how this harbor is on the west side of the island. The current flows around the ends of the island and this causes a lot of odd swinging of the yachts. Thank goodness they added 30 mooring balls here, like every harbor in the BVIs. 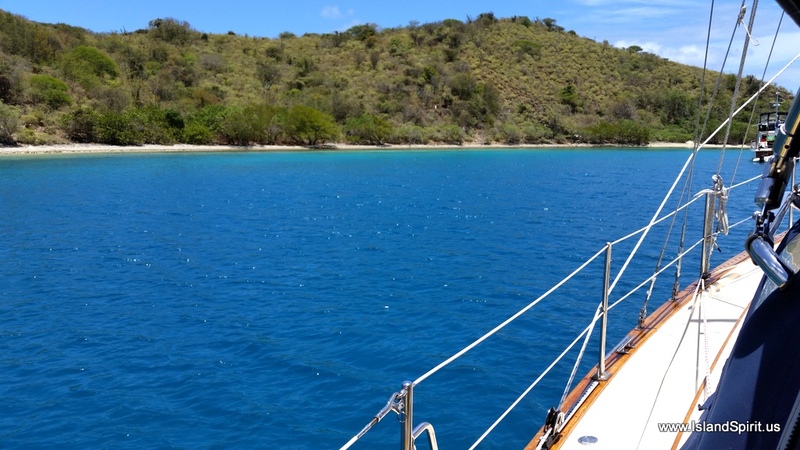 The moorings are a great idea to help the charter boats, and they are wonderful for protecting the coral reefs. At $30 – $35 per night, they are a expensive for cruising yachts….$900 + per month! The waters left for anchoring here are 40-50+ feet deep, making it difficult to anchor. This harbor really needs the mooring balls due to the currents and the wrap around swells. 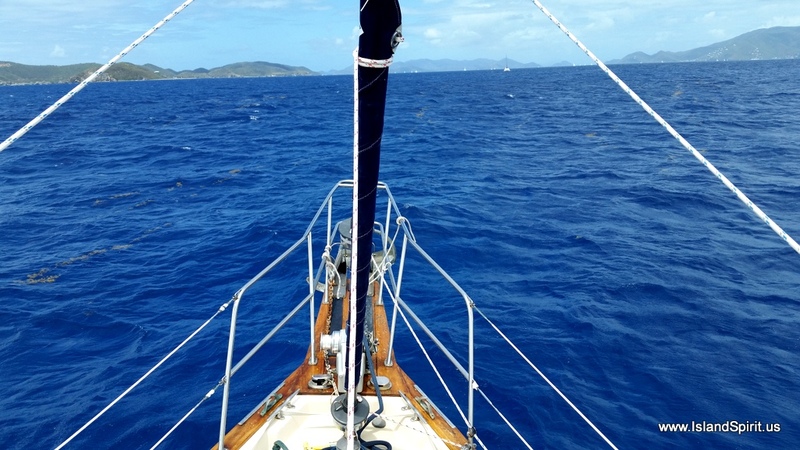 NOTE: When the winds are lighter and there is no south aspect to the east winds, and no swell, we will anchor in the little bays to the right where J.M. and Kimberly IP 420 Pura Vida recommended. 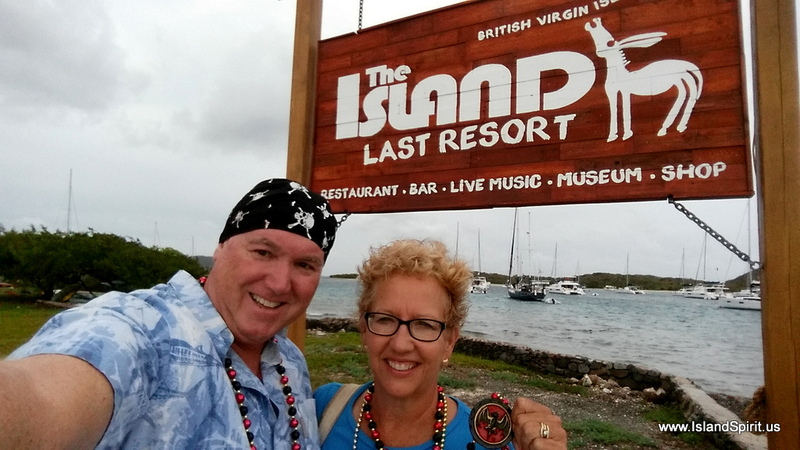 We moved back to Trellis Bay from Cooper Island and reconnected with “Team Six Knots” so we could attend the Pirate Party at the Last Resort, now referred to as The Island of Last Resort. We were glad IP38 AMORA II and IP380 ANTARES decided to stay for the festivities. 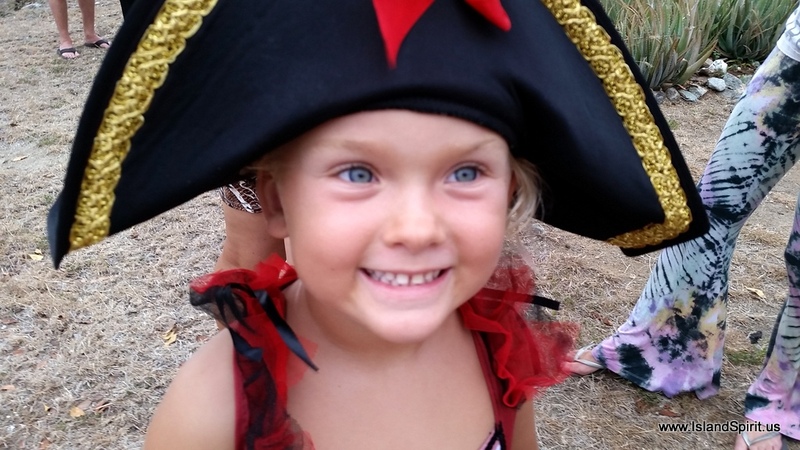 The party was to commemorate the anniversary of the death of Black Sam Bellamy, whose ship was lost at sea off the coast of Cape Cod 300 years ago. “Black” referred to his long black flowing hair tied back into a ponytail. He chose not to wear a white powdered wig, which was fashionable at the time. When he died at age 28, Sam was the wealthiest pirate in history, who was never reported to have killed anyone. 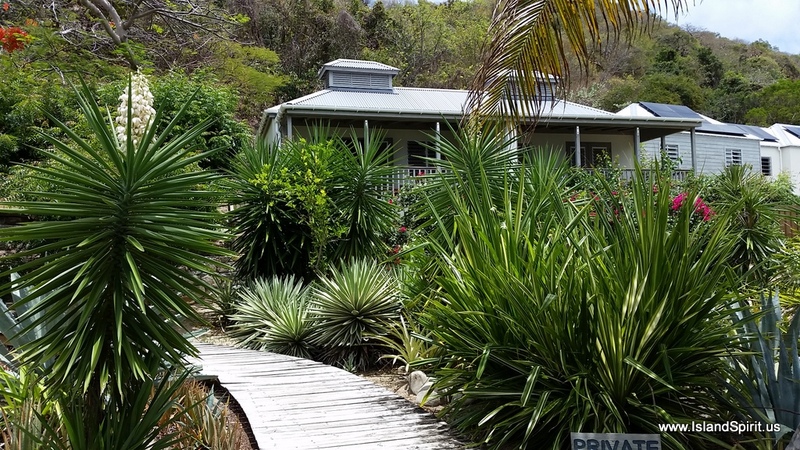 He was known to hide in Trellis Bay and the island where The Last Resort is located is named Bellamy Cay. Happy Birthday, Michael! A day to remember! 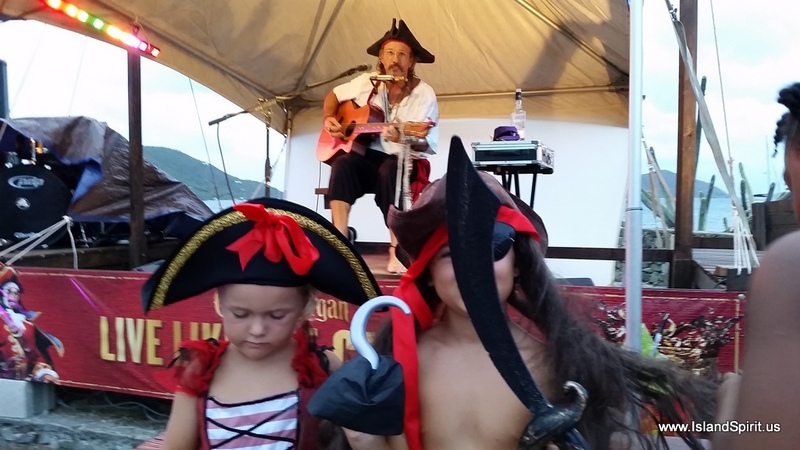 The party started with Michael Beans singing pirate songs and sharing the story of Sam Bellamy. 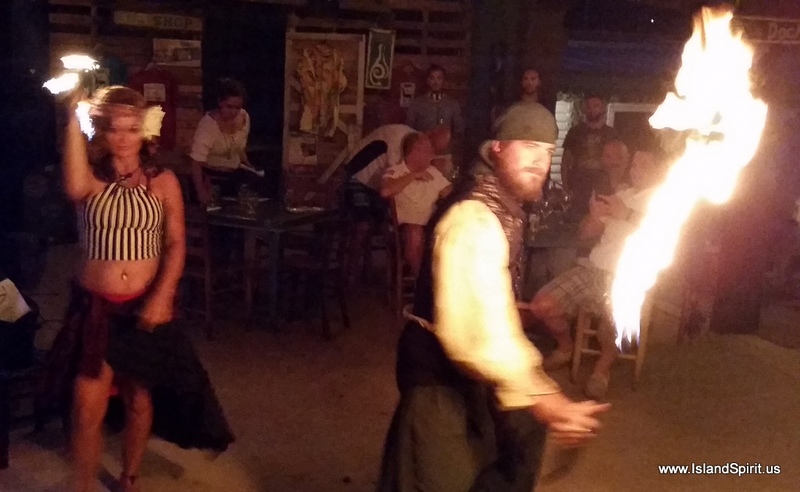 It continued with pirate trivia, games for the children, a conch blowing contest (Hayden won again! 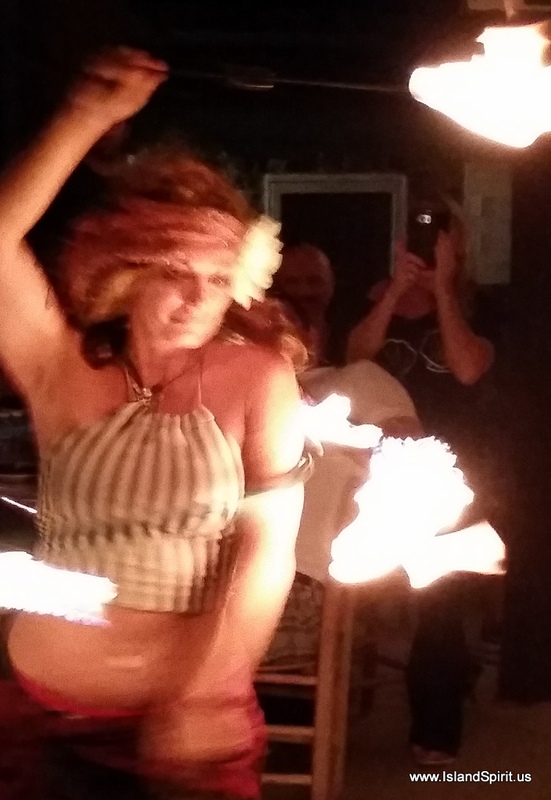 ), a fire dancing couple and several fine musicians. 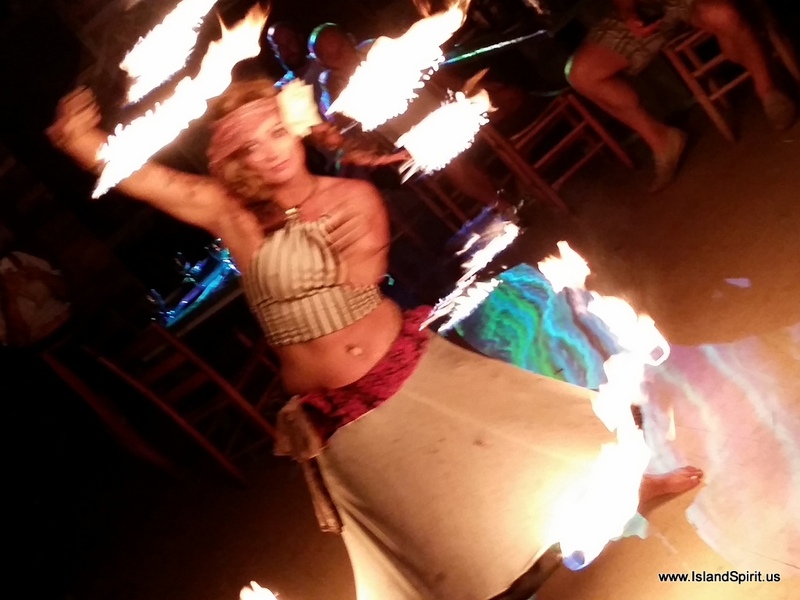 Here are some photos of the party…. 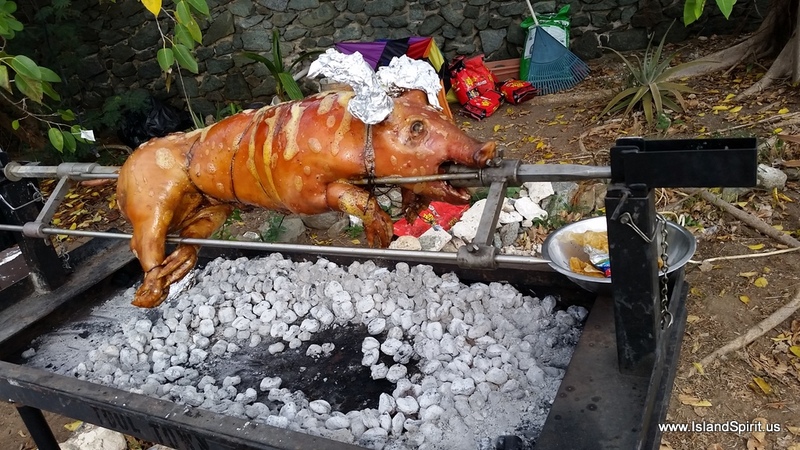 What would a Pirate Party be without a pig roasting on a spit? 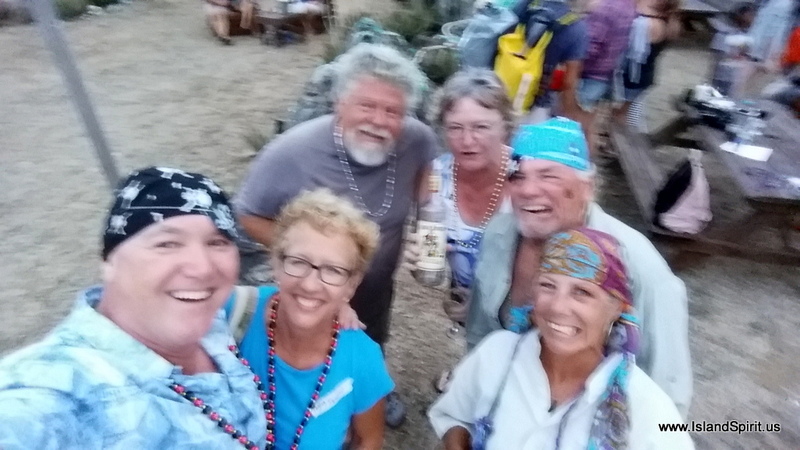 We survived and here is the selfie to prove it!